And to follow up Hillary’s seriously cheesy croque monsieur – the Cuban. Get that oven blazing and ready a pork loin – this is one sinful sandwich (notice it’s categorized as a vice). Pressed between sweet onion bread (I couldn’t find the traditional “cuban” bread the sandwich is usually made with) are layers of roasted pork, swiss cheese, more pork (ham), pickles, mayo…only the good stuff. Upon doing a little research “the Cuban” was once a lunch staple for Cuban workers in cigar factories and sugar mills. Immigrants (thankfully) brought this combo stateside in the early 1900s. I first had a Cuban at a little restaurant in the Caribbean where boaters stopped in to refuel and grab some provisions (aka stock up on beer and rum). 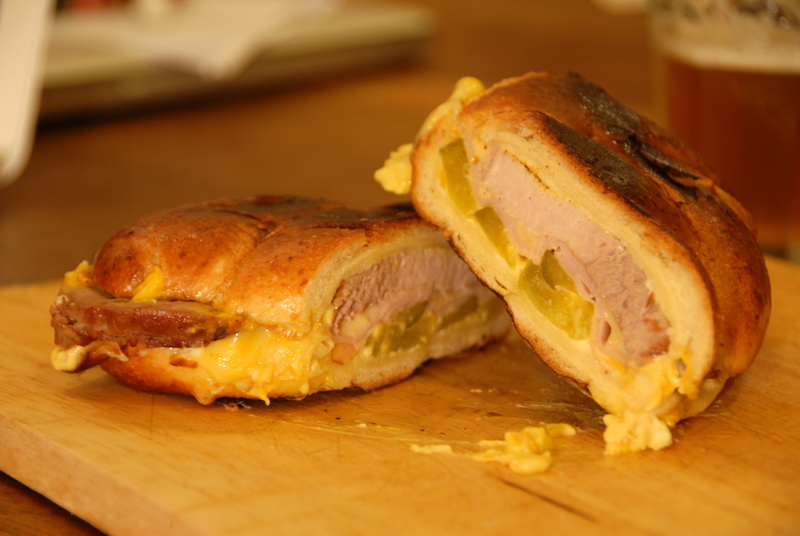 It was a perfect pressed combo of meat, cheese and a little something extra – dill pickle and a kick of yellow mustard. Just what the doctor ordered after a taxing day of relaxation. Roasting a pork loin yourself really is quite simple and it’ll give your sandwich that extra umph. 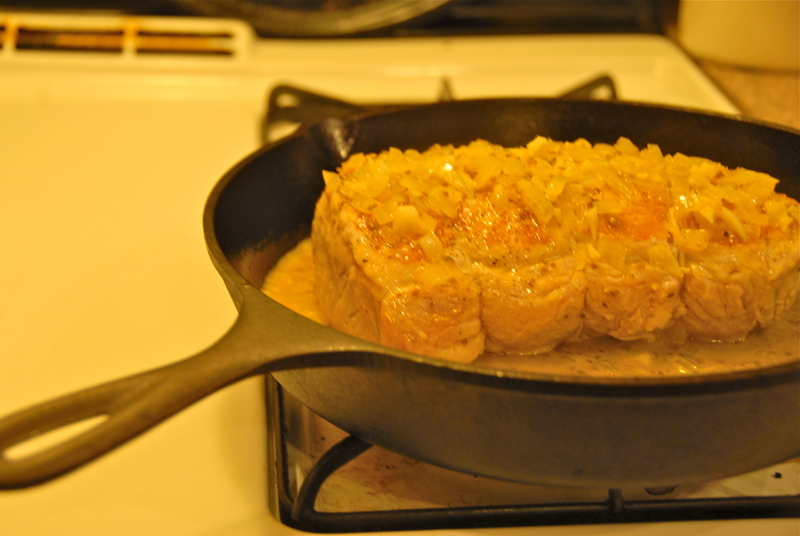 I surrounded it with a Cuban-inspired pan sauce which keeps it extra moist and lends a citrusy-herb flavor. Toast the bread face up in the oven. Next lather the bread with mayo and mustard. Top with the ham, dill pickle spears, pork roast slices and swiss cheese. Place in the hot oven to melt the swiss cheese. 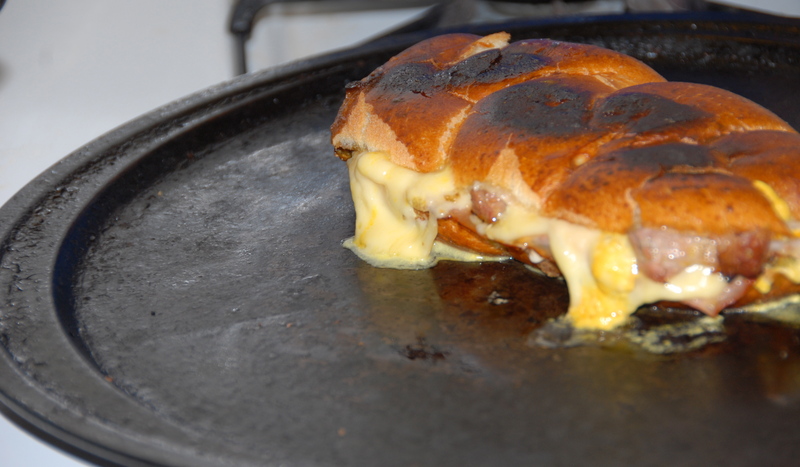 This is a pressed sandwich so once the cheese is almost melted put the sandwich together and press with either a panini press (all the rage to have one of these bad boys…) or do as I did… put a piece of foil under the hot cast iron pan (careful!) and leave it on the hot pressed sandwich until perfectly smooshed like so… Even though this sandwich may take a bit more time than the average cold cut it’s COMPLETELY WORTH IT! The pork! The pickles! Need I go on!? Some say the traditional cuban also contains salami…I’ll let you decide how many pork products you want (or need) between two slices of bread. I’m sure it’s a “the more the merrier” situation…either way, enjoy! This entry was posted in Condiments, Garlic, Pork, Vices and tagged Cuban, dill pickle, ham, mayo, mustard, pork, sandwich. Bookmark the permalink.